In todays’ first reading from the book of Proverbs 9: 1-6 Wisdom is personified as a Great Lady who gives a dinner party and invites everyone. The banquet is ready to be served: the lamb has been roasted, wine poured out, table set with silver and flowers. “Come and eat my bread, drink the wine I have prepared. Leave your folly and you will live. What a beautiful invitation. We have to unwrap God’s word from the Jewish culture in which it was received in order to apply it to our own lives today. Food had a sacred value in the Semitic world. Eating in common established a bond or sacred ties between God and God’s people. In today’s Gospel, Jesus calls himself “the living bread which has come down from heaven.” He adds, “Those who eat this bread will live forever. Those who do not eat it will have no life.” To the ears of a Palestinean Jew, the Semitic phrase “Eat my flesh” would be clearly understood as: Eat my body, my whole personhood, all of me, my life and my love. “Drink my blood” had much the same sense to them that the word “heart” conveys to us today. It would have been understood by a person in Jesus’ time to say, “I love you with all my blood.” Blood meant life to a Jew. Eating and drinking meant a vision of God to them. Bread was a sign of deep, loving intimate friendship, so to break bread was to break one’s life and to give it to others. The entire cosmos is God’s Mystical body and the blood flowing through it is God’s Love. In the Eucharist the whole cosmos is praying through us. It is a cosmic event in which we are slowly transformed into the greater Body of Christ and strengthened to go out to manifest more clearly the presence of Christ everywhere. 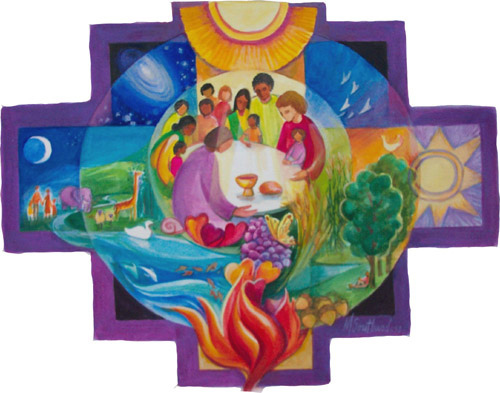 Eucharist is ritualised so that we give our “Yes” to being a sacred Presence in the world. As Augustine says: “Receive who you are – the Body of the Risen Christ”. Eucharist is a practice in awareness, taking us to a place of encompassing love so that what is hidden may become manifest. It is what I say “Amen” to when I receive Communion. It teaches us the delicate art of giving. “It is not a prize for the perfect but a powerful medicine for the weak,” as Pope Francis tells us. The gratitude that wells up in us is the very essence of the Eucharist. We are commissioned and strengthened at the end of every Mass to “go out manifesting the presence of Christ everywhere”, to break open our hearts with others so that we can break open the bread together. Unless there is an ear to hear, even the most powerful message from the mouth of God is lost forever. How have I allowed Eucharist to flow through me today? In what way have I blocked it? How shall I allow the Eucharist to flow through me today/in this particular situation?